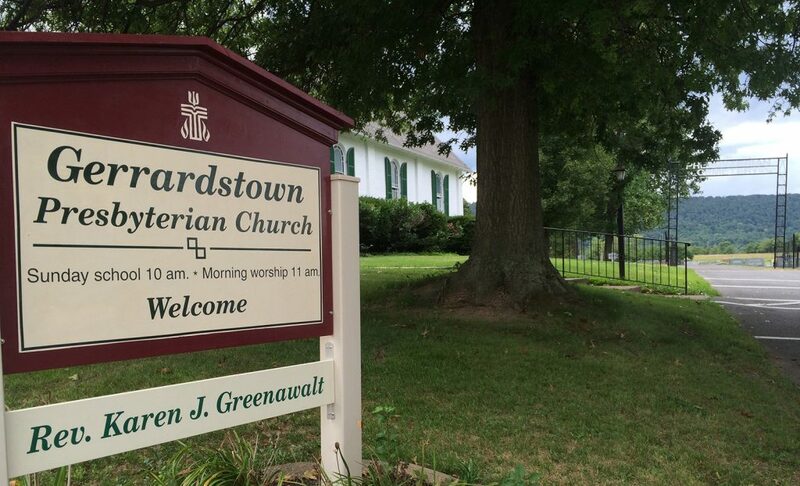 Welcome to Gerrardstown Presbyterian Church! We hope you will join us for Sunday mornings at 11am. Our Sunday worship is traditional in style but somewhat casual in dress. We meet in the Sanctuary building with the bell tower. Service begins at 11am. If you arrive 7-10 minutes before that you will have plenty of time to park in the parking lot and find a seat. Children are welcome to join us in the sanctuary for worship and come forward for a brief children’s message early in the service. They are then welcome to come down to the classrooms below where there is a nursery and activities for older children or to stay in worship with their parents. A unisex handicap accessible restroom is located on the main level and two other restrooms are located our lower level. Gerrardstown is a small village that lies at the base of North Mountain, approximately 4 miles from Interstate 81 at Exit 5 and about 60 miles from Washington, DC between Winchester, VA and Martinsburg, WV. It was once a community of farmers and orchardists but the community is growing and changing. In 1993, the Church celebrated its bicentennial. A proud heritage is complimented by the desire to continue the work of the Lord with optimism and hope in our growing community. The congregation of the Gerrardstown Presbyterian Church invites you to join the vision we share that as disciples of Jesus we make disciples by loving unconditionally, sharing the good news, serving others joyfully, praying expectantly and believing God’s word.